The Classic Rock Coffee was the venue for Dawnstar's concert on 18 June 2016. 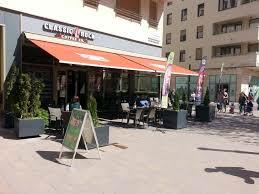 It is located in the eighth district of Budapest, not far from the heart of the city. The cafe is equipped with a relatively small stage located in the back. The venue also provides two amps for microphones or synthesizers. However, you have to bring your own guitar amps and drum kit. It is also equipped with air conditioning which is also an advantage in the summer.